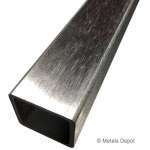 Polished 304 Stainless Steel Square Tube is a standard stainless square tube that has been polished to a 180 Grit Brushed Finish on its exterior for cosmetic and ornamental applications. Unlike the dull mill finish of standard stainless tube, polished stainless square tube allows your projects to have a more finished look with excellent corrosion resistance making it ideal for marine projects, architectural design, restaurants, store fixtures, handrails and more. Just like standard stainless square tubing it has an inside and outside corner radius, with a interior weld seam. 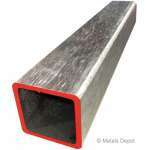 California Residents: See Prop 65 Warning Click for Stainless Square Tube in Mill Finish. 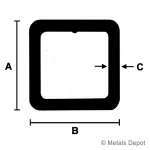 Cut to Size Lengths +/- 1/16"